Colour Therapy is a complementary therapy for which there is evidence dating back thousands of years to the ancient cultures of Egypt, China and India. Colour is simply light of varying wavelengths, thus each colour has its own particular wavelength and energy. The energy relating to each of the seven spectrum colours of red, orange, yellow, green, blue, indigo and violet, resonates with the energy of each of the seven main chakras/energy centres of the body. If you can imagine the chakras as a set of cogs/wheels, they are rather like the workings of a clock or an engine; each cog/wheel needs to move smoothly for the clock/engine to work properly. Thus good health and wellbeing is achieved by a balance of all these energies. 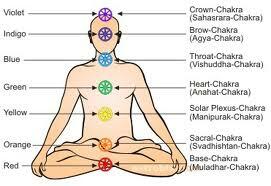 Balance of the energy in each of the body’s chakras is very important for health and wellbeing. Colour therapy can help to re-balance and/or stimulate these energies by applying the appropriate colour to the body and therefore re-balance our chakras. Red relates to the base chakra, orange the sacral chakra, yellow the solar plexus chakra, green the heart chakra, blue the throat chakra, indigo the brow chakra (sometimes referred to as the third eye) and violet relates to the crown chakra. Colour is absorbed by the eyes, skin, skull our ‘magnetic energy field’ or aura and the energy of colour affects us on all levels, that is to say, physical, spiritual and emotional. Every cell in the body needs light energy - thus colour energy has widespread effects on the whole body. There are many different ways of giving colour, including; Solarized Water, Light boxes/lamps with colour filters, colour silks and hands on healing using colour. Colour therapy can be shown to help on a physical level, which is perhaps easier to quantify, however there are deeper issues around the colours on the psychological and spiritual levels. Our wellbeing is not, of course, purely a physical issue. Fortunately, many more practitioners, both orthodox and complementary are now treating patients in an holistic manner. That is to say, we are body, mind and spirit and none of these areas function entirely alone; each has an effect upon the other. This is why Colour Therapy can be so helpful since colour addresses all levels of our being. As babies we first experience colour in the womb where we are enveloped in a nurturing and comforting pink. Then as a child we associate with colour as part of our first learning processes. These first associations contribute to our consciousness. As we get older we attach many different feelings, memories and meanings to certain colours and this can then become a feature in our subconscious. We can build up prejudices to colours which have happy, sad, or frightening connotations for us. All life experiences make an impression upon us. Some experiences will be positive and some negative. It is these negative experiences which can manifest themselves physically over time as dis-ease. As an example:- perhaps we have, over the years, been in a situation where we have felt unable, for one reason or another, to speak our mind, or to express our own truth. This can manifest as a problem in the throat chakra. The throat chakra relates in the spiritual aspect to self expression. Thus, if our self expression has been blocked, the energy in this area will not be free flowing and in turn this can lead to a physical manifestation of dis-ease. Noting strong colour preferences can also be a helpful aid to finding possible problems and working with the appropriate colour/colours to help to dispel negative feelings, free blocks and re-balance the body emotionally, spiritually and, in turn, physically. Colour Therapy is a totally holistic and non-invasive therapy and, really, colour should be a part of our everyday life, not just something we experience for an hour or two with a therapist. Colour is all around us everywhere. This wonderful planet does not contain all the beautiful colours of the rainbow for no reason. Nothing on this earth is here just by chance; everything in nature is here for a purpose. Colour is no exception. All we need to do is to heighten our awareness of the energy of colour and how it can transform our lives. A professional therapist will help you to do this. The capacity for health and wellbeing is within us all. Colour therapy is safe to use alone or alongside any other therapy whether orthodox medicine or another complementary therapy and is safe and helpful for adults, children and animals too. Please be aware that no complementary therapy should be considered as an alternative to professional medical advice where necessary and no properly qualified complementary therapist would suggest that, neither would they suggest that you stop taking your medication etc. If you are taking medication you should consult the prescribing professional before you stop taking it. QUALIFICATIONS Secondary or Equal or Practical Experience. SUBSCRIPTION $ 100 or INR 2400 & Local training charges will be extra. BY CORRESPONDENCE You can take the course from your home even . We shall be sending you the study material (books, chart, instrument), on completion of your time duration, one written exam would be taken . Question paper along with an answer sheet shall be sent to you at your postal address & you have to return it duly filled for getting your certificate. BY INTERNET You can complete this course by internet also. Institute can provide you the study material (Chapter wise ) on your E-Mail ID & you can clear your doubts through E-Mail. DURATION Two Months for Correspondence & Internet. NOTE NOTE: 1. You need to attach one latest passport size photograph, last education certificate, identity proof & experience certificate with the application form. 2. Fee can be paid via Cash or Cheque in “State Bank of India” Current Account No: 32551925192 with Name of ACUPRESSURE SANSTHAN IFSC Code No. SBIN0005870 Branch- K.N. Nagar, Jodhpur. 3. If you wish to take Practical classes (for Internet & Correspondence) the facility is provided at our Jodhpur centre for three days on paying extra fee of rupees 800 (For India) & $ 50 (For foreign). 4. Charges for instruments, literature, chart & books will be extra for regular course other than the fees. 5. Any dispute will be settled Jodhpur Jurisdiction only.